» How about a civic auditorium? How about a civic auditorium? These yard signs remind me that Albany may have missed an opportunity to build a civic auditorium as part of the downtown urban renewal program. But maybe it’s not too late. The yard signs are all over town. 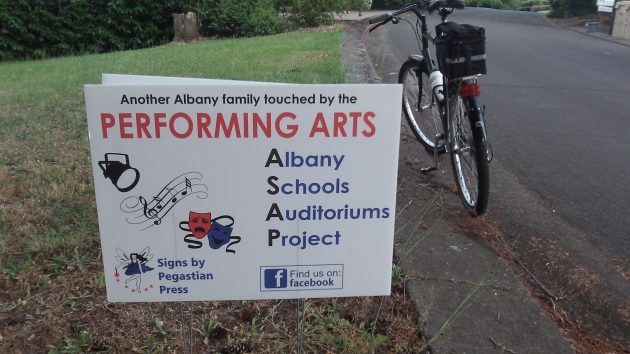 They are part of a campaign to persuade the school board to include proper auditoriums at both Albany high schools when it puts together its next proposed bond issue for school construction and repairs. That bond issue is likely to be put up for an election next year. It’s going to be big, possibly $100 million or so. And adding a few million dollars more for auditoriums may not add to its taxpayer and voter appeal. Back in 2001, when the city council formed the Central Albany Revitalization Area, No.47 on the new district’s list of possible projects was to “establish and enhance public facilities such as libraries, museums, performance areas, parks and the arts.” The plan envisioned planning for this category would cost $550,000. CARA has spent $422,000 of that, all of it toward the Albany Carousel. But overall, the district had projected spending of more than $40 million in “hard costs” during its lifetime, which is now roughly half over. Of that estimate of total expenses, more than $28 million is left for eligible projects on the list. I don’t know the answers to these questions. But I’ve been sitting through CARA meetings as a reporter and spectator since the beginning, and I don’t recall the board ever considering a civic auditorium big enough to attract hundreds of people downtown several times a month all year long. Instead there’s been talk of “retail,” as though the shopping habits of Americans had not changed in 50 years. Excellent point HH! Downtown needs foot traffic to thrive. Lots of people milling about. Retail isn’t going to do it unless it’s a big boxer. Surely that is not chic enough. Feasible that an active auditorium could help. Similar shaped facility as the carousel and call it the Barbell. I vote “yes”. The high schools should focus on their proper role of basic education. Leave “performing arts” to the Community Colleges, vocational schools, or liberal arts colleges in the state. This is why K-12 is getting such a bad rep: continually trying to expand their basic purpose, which is to give each child a foundation education. But, as institutions are, the main law is “grow or die.” I hope the voters will put a stop to this silliness. TC — it’s pretty clear what your positions are. It seems that you also object to other citizens displaying their opinions via lawn signs. Election rules aren’t in play. There’s no discriminatory behavior involved. The rules are different for different conditions. new facility–you’ve drunk the cool-aid. Of course it is a campaign to sway voters. No sugary drink required. Just an understanding of how the world works. These citizens have a right to voice their opinions and seek backing from other voters. If enough others agree with the proposition, it moves forward. You and I get one vote each. the point is –the city has a code on campaign sign placement/ timing/duration and size. should not be violated with intent. There’s no current “campaign” since there’s no election involved. Seems that you wish to stifle a position to which you are opposed by applying a non-relevant rule. Interesting viewpoint regarding regulation of expression from a member of the fourth estate. Also, regulation without enforcement is a wasted exercise; while enforcement requires money to pay someone to do that job.